The Student Ministry at Christ the King is growing faster than ever and we need your prayers! 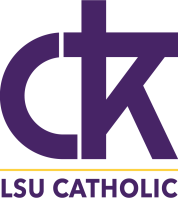 Our Lady's Fighting Tigers is made up of parents, family, and friends of students & staff of Christ the King at LSU. Our intercessory groups gather to pray for the intentions of our Student Ministry. 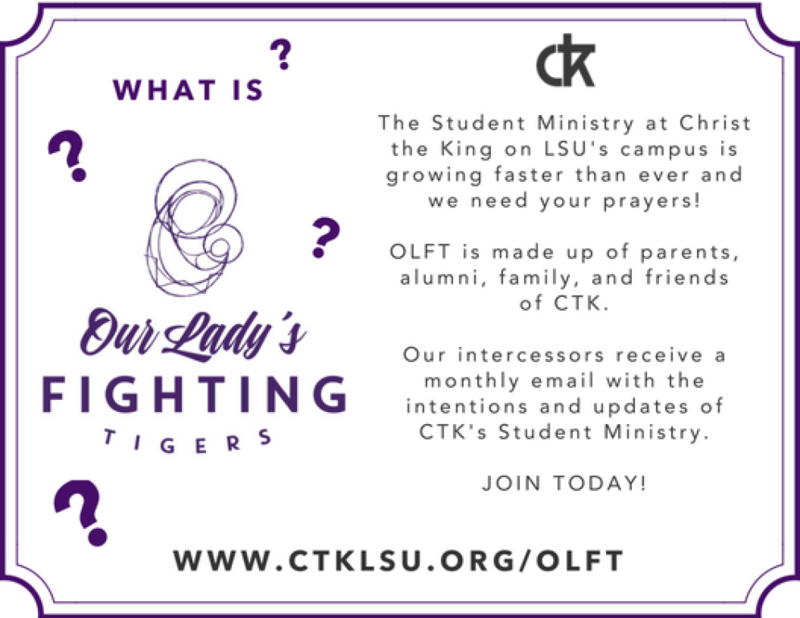 "Our Lady's Fighting Tigers (Parents, Alumni, & Friends of CTK who want to pray for our ministry)"
Working on the campus of LSU allows me an opportunity to see daily the questions ringing in the hearts of the students on campus. The hearts of your sons, daughters, grandchildren, friends and this world's future leaders. Their desire for happiness is palpable. Their search for answers to deep life questions is obvious. Here at Christ the King, we get to build relationships and share in the beauty of each person’s story. Beneath this ministry is the firm foundation of intercession, the true heartbeat of any ministry. St. Mother Teresa had friends around the world who suffered; she saw each person’s offering of suffering as the spiritual strength behind every act of love she made. The prayers and sufferings of those around the world helped supply the strength she needed in her mission to love the poorest of the poor. 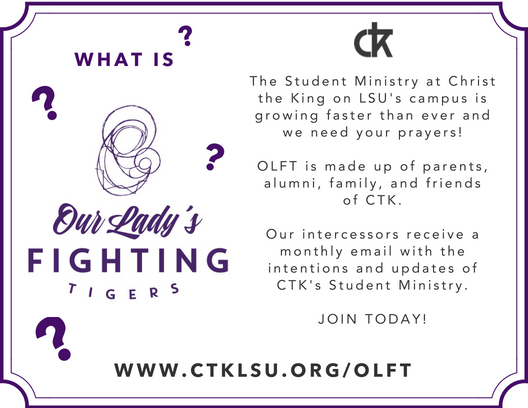 We have a unique opportunity here at CTK to invite students to encounter—literally—the Person of the Holy Spirit. I look back on my own prayer for adventure and surprises in college, and I see now that I was asking for the LORD to be so present in my life that I was different, that I was new, that I was free. I look back now and see that I wanted a deeper relationship; that I wanted to be free in who I was and how I lived my life. I wanted the abundance that only the Spirit can give. We want these same gifts for the students of LSU. I want them to know in the depths of their beings the very real love that is the Holy Spirit within them. Please join us in prayer over this entire campus! Please unite with us to bring to the LORD our intentions. We desire and trust in Him to bring forth miracles and healings; to break the chains and lies that bind His children. In the students’ deep desire for adventure and wonder, I believe that the answer to all the questions they’re asking is Christ. Thank you for your prayers. Thank you for leaning into this space of hope and promise with us. The Lord, our God, is faithful, and He will not be outdone in generosity. 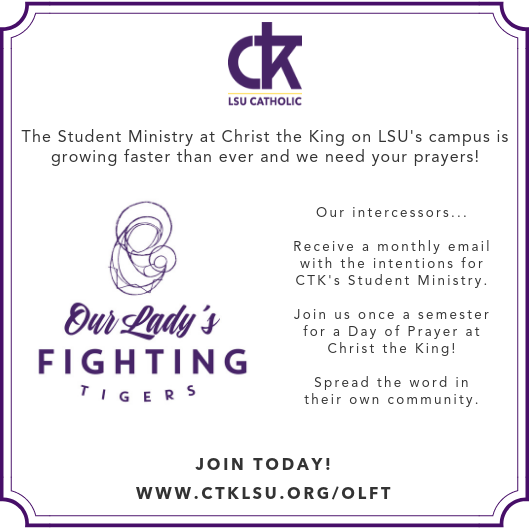 Spread the word in your community & home parish by sharing information about Our Lady's Fighting Tigers! Below are some various graphics that you can share in church bulletins, with your community, or on social media!